I'm Still Standing (Yeah Yeah Yeah), oil on linen, 24 x 30 inches, 2010, collection of the artist. The origins of still life as an independent genre go back to the Italian Renaissance city states and the cities of the Low Countries, the founding centers of early capitalism. Its emergence reflected the increasing wealth that created a market for domestic paintings, the material opulence of the new culture, but also a new analytical realism; an interest in objects and objectivity, and in the visual process itself, that embodies the spirit of early modern science. The depiction of objects naturally caters to the celebration of material values. Since the painting is itself a marketable object - a commodity - representing other commodities, it can mirror and comment upon the symbolic processes of commoditization and desire, in ways that ultimately reflect back upon the painting’s own intrinsic value. This is especially true in a commercial civilization such as ours. Indeed, if the still life painter is not aware of and responding to these processes, there is a danger that the work will embody, beyond skill, only a rather literal and crass materialism. 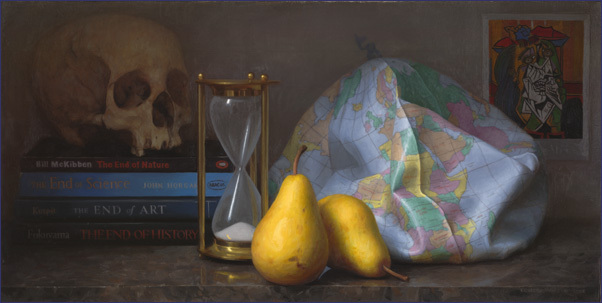 Still life painters have developed various strategies to ‘handle’ the implicit materialism of the genre, different for each artist and period, yet (at the risk of great over-simplification) perhaps reducible to two major approaches; vanitas and formal. What I call formal still life tends to minimize the importance of the content of the picture; it takes everyday objects of no great significance and subjects them to a virtuoso painterly treatment where the resulting image is so formally perfect, so calm and harmonious and tasteful, that the picture seems the embodiment, not of a vulgar materialism, but of a pure and unimpeachable sensualism, a serene aesthetic innocence. Such paintings invite appreciation in terms of ‘disinterested contemplation’, ‘pure form’. The other approach, which could be called vanitas, emphasizes content, and throws obstacles in the way of pure aesthetic enjoyment by the inclusion of objects laden with meaning and interest, objects which cannot be easily aestheticized. The significance of the skull, for example, it’s meaning for us as mortals, cannot be easily ignored. Like many other classic vanitas symbols (the dead animal, over-ripe fruit, crucifix, etc. ), it is essentially an object of fascination and distaste. Thus, instead of the calm, unimpeachable good taste of formal still life, vanitas tends to be dramatic, conflicted, anxious, morbid, ironic and even (deliberately) tasteless. 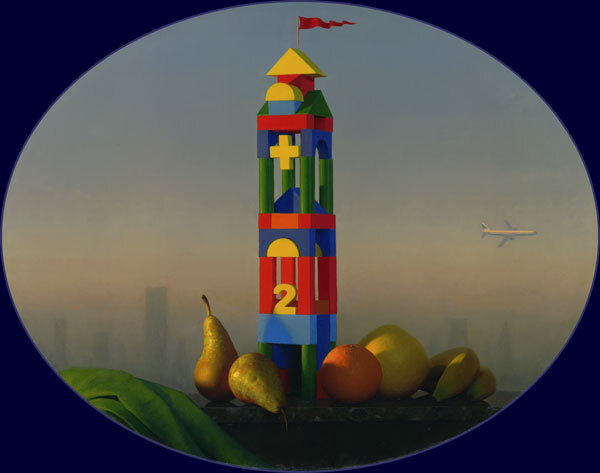 Party Animal, oil on linen, 12 x 12 inches, 2010, private collection. I think the fact that I attempt both strategies may confound; most still life painters tend to stay on one or other side of this divide, and this often reflects differences of temperament and belief. I know my audience is similarly divided; those who admire, above all, my grapes or ‘classical’ still lives tend to be vexed by the vanitas works. I regard vanitas and formal still life almost as independent sub-genres with their own rules and standards, and, like tragedy and comedy, see no reason why one cannot practice both. Formal still life is perhaps the more difficult to practice, partly because of the technical discipline it requires, but also because its subject matter is more restricted; it tends to confine itself, not only to commonplace objects, but to objects with a neutral or low semantic charge. Though a mobile phone, for example, is certainly a commonplace object these days, placing one in a formal still life would be a highly unorthodox and dangerous move, because it would tend to disrupt any classic effect of timeless serenity. Nokia or Siemens? Makes and models replace each other so fast that such a picture is bound to date quickly, and instead of inviting aesthetic contemplation, it may remind you to check your messages. Because of such issues, the subject matter of formal still life tends to revolve around a stock of simple, traditional objects: baskets, bowls and bottles, flowers and fruit; the sort of things one might have found on domestic tables at any point in the last few hundred years. Such easily familiar objects help feed a dream of peace, of domestic comfort and sufficiency, and perhaps a certain nostalgia for a simpler, more basic existence. I see nothing wrong with this, but it does mean that the formal approach can depend as much for its effect on what is suppressed and excluded as what is actually in the picture, and such strict canons of good taste do make it harder to avoid the cliché, harder to innovate. It may be possible to make a classic still life with, say, television sets and plastic packaging, but it is probably more difficult to do it well. In formal still life, reality is often subjected to a simplification of form, a concentration on bare essentials (what is sometimes called ‘abstraction’) that aims to leave the viewer aesthetically purified. Vanitas, on the contrary, tends to revel in a rich and deep illusionism in which every possible trick is deployed that can draw the viewer in, entangle and implicate him in its world. Where formal still life aims at an inscrutable purity, a timeless perfection, vanitas deals in corruption, decay; the present is not ‘eternalized’ but rather shown to be futureless. If the spirit of Apollo presides over the formal still life, Dionysus is the reigning deity in vanitas, inviting us to eat, drink and be merry, but in the ever-present context of suffering, death, the transience of our world. A disruptive, mocking spirit is at work, deflating hubris, celebrating humbug. For a painter of my disposition, it offers relief from the cool purity of the formal approach. It allows a symbolic play of text against subtext, a subversion of form by content that opens up the question of meaning. Vanitas means literally ‘emptiness’ in Latin; in its broadest sense it expresses the meaninglessness of earthly life and the transient nature of vanity. It is often used in conjunction with the quote from Ecclesiastes, Vanitas vanitatum omnia vanitas in the Latin Bible, which is translated as ‘Utterly meaningless! Everything is meaningless’ by the New International Version. Originally, vanitas marked an uneasy compromise between the blatant materialism and worldliness of early capitalism and a Christian heritage that identified wealth with evil, with all that would be swept away in the coming apocalypse. Present pleasure was thus set against a morbid anxiety about the future. In an age more convinced than ours of the existence of God, the vanitas still life possibly served only as a reminder not to be deflected by earthly delights from the prospect of a heavenly future. We are still promised a better future, although these days in more secular terms: scientific advance, economic growth, increased social justice, greater political and artistic freedom – the ideology of ‘progress’. But there is still plenty of room for morbid anxiety about our future (both personal and planetary), and these anxieties are fertile ground for a vanitas painter. Contemporary vanitas may seem particularly subversive, because it inevitably mocks ‘progress’ and exposes a deep vein of cultural pessimism, or perhaps nihilism, that we struggle to articulate through official channels. Today, vanitas tends to express the marginal or critical viewpoint, the view from the edge. Even so, edges are not necessarily bad viewing positions; at times they may afford the best perspective! What I’ve said here of still life is, of course, simplified for the sake of brevity, and intended not so much as a complete analysis of the genre as a personal perspective that may shed some light on my own approach to still life painting. There really are a multitude of different approaches one might take, as many (perhaps) as there are individual painters, and my division of the genre into formal and vanitas may not be particularly useful when looking the work of another painter. In my own case, I have come to terms with the genre in a roundabout way. The human form was my first love as a painter, and I started painting still life because sufficiently patient living models were hard to find or expensive; at least objects generally stayed put and didn’t charge by the hour. Objects, too, can be painted under ‘studio conditions’, without the problems of variable light and weather that plague landscape painting, particularly in our climate. It helped that still life paintings were generally small and saleable, allowing me to diversify my output while developing skills as an observational painter. I’m no purist with regard to photography, but one of the great benefits of still life painting is that it has freed me from dependence on the photograph. With the object in front of me, there is simply no need for a photographic reference, and basing my work upon direct visual experience has, I think, helped to anchor it, to give it a character and strength that the ‘predigested’ photographic source would not have afforded me. I still didn’t take naturally to painting objects; they seemed so inert, lifeless and uninteresting! I found that I had to resort to all sorts of ploys to make still life ‘work’ for me: importing the human image by using life masks, employing text and narrative themes, creating a sort of stage in which the fruit and other objects become like actors in a miniature frozen drama. Though I feel I have grown into still life as I’ve practiced it, and am much more comfortable now painting objects ‘for their own sake’, I think I still have something of an outsider’s view of the genre, and still feel the need to fight its norms. 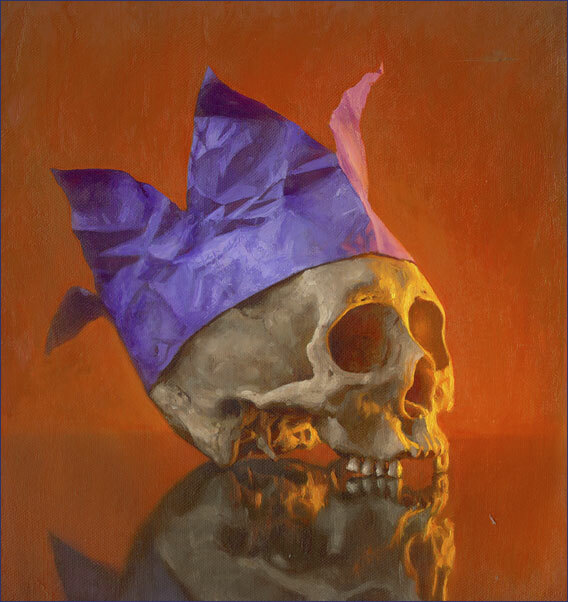 I hope this brief essay helps to explain the motivation behind the more complex games I play in some of these still life paintings, and particularly my notion of vanitas, which may be foreign to some viewers’ frames of reference. But in all of these paintings, I’ve sought to provoke thought, to stir up the mental sediments, to sum something up. The idea that a painting can be a microcosm, a compressed or metaphorical image of the world, complete on its own terms, is what really interests me. I hope it interests you. This essay was first published in Conor Walton: Landscape and Still Life exhibition catalogue, Jorgensen Fine Art 2009.